As the last door I went through that wasn’t mine was my son’s school door, it got me to thinking about my own school. I refer to it as mine loosely, for two reasons. One is I haven’t taken a course in almost a year–I’ve either been too busy making money to afford one, or too broke to afford one. There has to be a solution there somewhere … Save the money? Yeah. But I keep spending it on stupid things like hydro and gas. The other reason I hesitate to call it my school is I’ll probably never walk through the front door of it. According to Google maps, it’s about 4,600km (2,858 miles) away, which is apparently a 42-hour drive. That’s one hell of a commute every day … or every four days if I don’t sleep. It really looks like a lovely place though. https://www.sfu.ca/ Lovely enough that I’ll try to visit one day. Weird that we now have the technology and means to go anywhere in the world, but we rarely do. I imagine if I cut off my Internet and saved the money instead to fly around the world, I’d get out a lot more. But then, how would I know where to go without the Internet to show me the great places I could visit? Sure, I could go to restaurants and use their Internet, but that would result in spending my money again. Especially if I have to drag the kids along so they could get their Internet fixes. Yeah, bad idea. 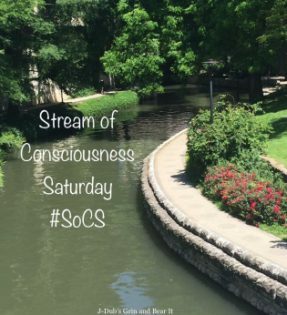 Categories: Blogging, Blogs, Life, Opinion, Stream of Consciousness Saturday | Tags: editing, Humor, inspiration, schools, Simon Fraser University, SoCS, travel, writing prompt | Permalink. I love continued learning and I am addicted to travel. Darn the dollars that don’t lend themselves. We will find ways and all our horizons will shorten! I’m a pretty serious no-travel time of my life. Not too far is where I can go. For now. Pingback: 🌞Sunshine Blogger Award🌞 – What if We all Cared? I hope you get to go back to school and I really hope you get to visit in person. Just reading blogs, I have learned about so many more places than I’ll ever be able to visit – still, I’m glad I learned about them. I didn’t travel much when I had kids. When we did go somewhere, it was a big deal. Now that they’re grown, I’m looking forward to traveling more. I just have to figure out dog care or how to take them…. The more we dream of places we would like to go, the closer they come to reality. That’s my story and I’m stickin’ to it.